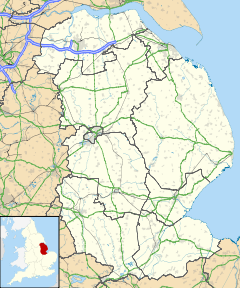 Welton (or Welton by Lincoln) is a village and civil parish in the West Lindsey district of Lincolnshire, England. The population of the civil parish at the 2011 census was 4,327. It is geographically situated 6 miles (10 km) north from Lincoln city centre. The name Welton by Lincoln distinguishes it from other Weltons in Lincolnshire: Welton le Wold and Welton le Marsh. The name means, roughly, "village with a well", and a village well exists, complete with Victorian pump. There is evidence of both Roman and Celtic settlement, and the village was established by the time of the Domesday Book, in which it is mentioned as "Welletone". The village church, the Prebendal Church of St Mary, was originally Norman, but only a few fragments of this survive in the tower walls; the present building is in the Early English style from around 1250. The six church bells were cast by Henry Harrison, nephew of John Harrison the carpenter and clockmaker. The 2001 Census recorded a resident village population of 5,000. However, this figure is for Welton ward, which includes other smaller villages nearby. The population of Welton civil parish was 3,821. Welton is noted for the rare chalk formation known as the 'Welton Band'. The layer is not visible from Welton, but on just seven sites much further north-east. To the south is the neighbouring village of Dunholme, near the A46. RAF Dunholme Lodge (on which the comprehensive school is built ) is next to both villages and was a wartime bomber base. Welton has two public houses: The Falconer, and The Black Bull which is reputedly haunted. On the village playing field is a Sports and Social Club. There is also a War Memorial, a golf course, campsite, Co-op store, local butchers and a veterinary clinic. The village library was refurbished in February 2008. Village schools are William Farr secondary school on Lincoln Road, and St Mary's C of E Primary Academy is on School Drive. The village has three Preschools. Welton youth football team provides for competitive teams between the ages of 8 and 18. In conjunction with Welton Parish Council, the clubhouse at Manor Park maintains a record of top scorers. The Scout Hut provides activities for Beavers, Cubs and Scouts, Rainbows, Brownies and Guides. ^ "Civil Parish population 2011". Neighbourhood Statistics. Office for National Statistics. Retrieved 3 June 2016. This page was last edited on 8 November 2018, at 13:06 (UTC).